Create thumbnails, convert images, create webpages, and view your photos ! Create thumbnail images, create webpages, create webpages of thumbnails, convert images to different types, and view your pictures all in 1 utility. You can create thumbnails and webpages, and convert image types an entire folder at a time, or individually if you choose. A picture preview window is included to continually show your new photo image as the size is being adjusted, and you can instantly calculate new image sizes with one button click. Makes thumbnails an entire folder at a time, or one at a time. Convert images from one type to another (keep same width and height). Convert images an entire folder at a time, or individually. Convert all image types in folder, or just select one type. Ability to make images larger, then save. Shows preview of new image as the size is adjusted. Shows instant calculation of new image size (bytes). Instantly resets image to normal size with one button click. Create webpages of thumbnails, that automatically open the full sized image when clicked. Create webpages of links, that automatically open the full sized image when clicked. 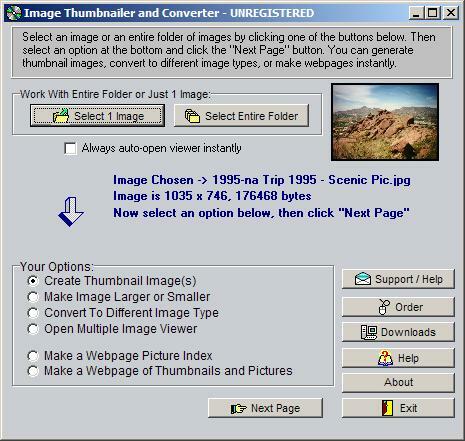 Image viewer allows zoom in and zoom out features and contains sliding scroll bar for image viewing. Never alters original images, but creates new images or thumbnails.